Many times people seek anger management or batterer’s treatment after being charged with a crime. 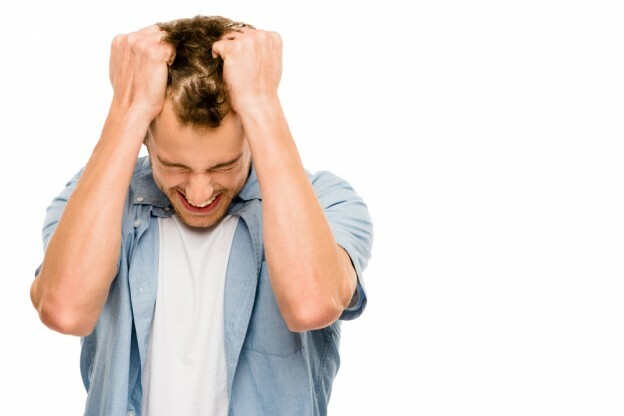 Sacramento County has court certified anger management programs that can be found here. A copy can be viewed and downloaded below. Sacramento County also has batter’s treatment programs certified by the county probation department. A list can be found here. A copy can be viewed and downloaded below. Contact Yolo County Probation for a list of approved anger management and batterer’s treatment providers. A list of domestic violence prevention resources in Yolo County can be found here. Information on Placer County Domestic Violence Programs can be found here. A list of domestic violence prevention resources in Placer County can be found here. Contact El Dorado County Probation for a list of approved anger management and batterer’s treatment providers. A list of domestic violence prevention resources in El Dorado County can be found here. 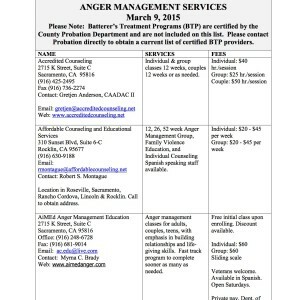 Contact San Joaquin County Probation for a list of approved anger management and batterer’s treatment providers. A list of domestic violence prevention resources in San Joaquin County can be found here. 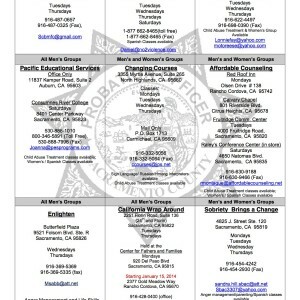 Contact Solano County Probation for a list of approved anger management and batterer’s treatment providers. A list of domestic violence prevention resources in Solano County can be found here.